A common request that I see come up from our field and customers is getting specific vSAN Ruby vSphere Console (RVC) commands to be made more generally available in other vSphere CLI/SDKs like PowerCLI for example. Funny enough, many folks do not realize that this functionality has been there since vSAN 6.2 and specifically with the release of the vSAN Management APIs which exposes all vSAN functionality programmatically whether you are consuming it from the vSphere Web Client, Embedded Host Client or from RVC. All of these tools have been built using the vSAN Management APIs. 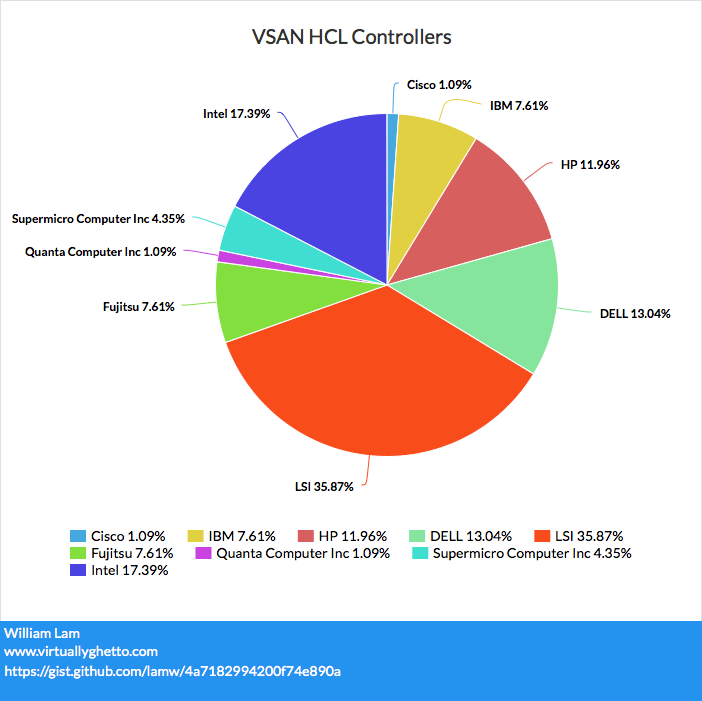 Although we have supported a variety of vSAN Management SDKs (language bindings) since its first release, I will say that PowerCLI consumption of the vSAN Management API has only been made available recently with PowerCLI 6.5.1 and it supports the latest release of vSAN 6.6 and can go all the way back to vSAN 6.2. Even with PowerCLI support, I still continue to see vSAN RVC requests come up time after time and it seems like folks still have not made the connection that RVC is just simply using the vSAN Management API just like UI does. What is even more interesting is that the source code of RVC can be viewed by anyone to see how each command is implemented and which APIs are being used. 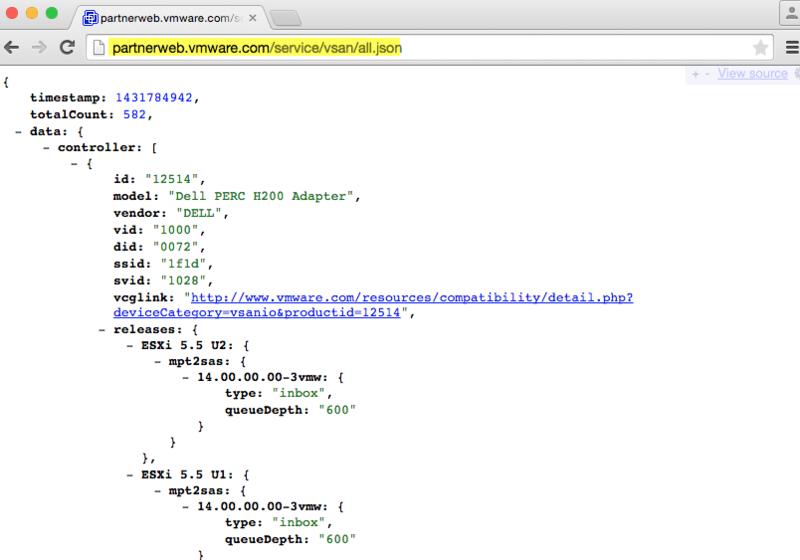 RVC is built using rbvmomi (vSphere SDK for Ruby) which provides access to both the vSphere and vSAN Management APIs. Given the number of requests that I have seen, I am going to assume that this is not common knowledge and I figured the best way to show how this work is with a real world example. 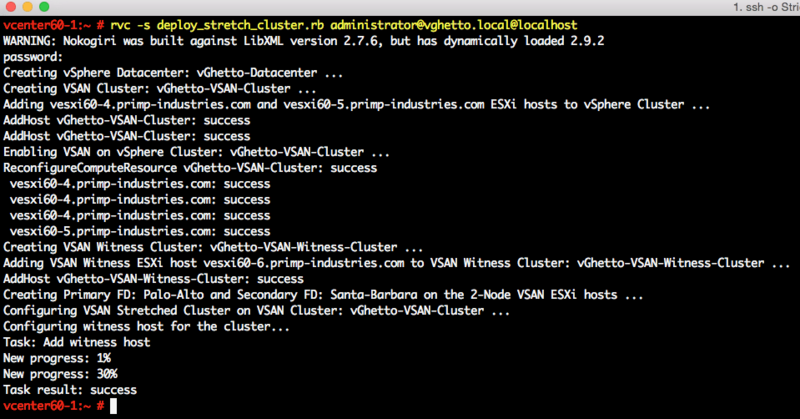 I decided to take the vsan.check_limits RVC command and create an equilvenet PowerCLI script that uses the vSAN Management API to provide the exact same information. Note: You will need to know how to use the vSphere/vSAN Management APIs and knowing a little of Ruby can also help. 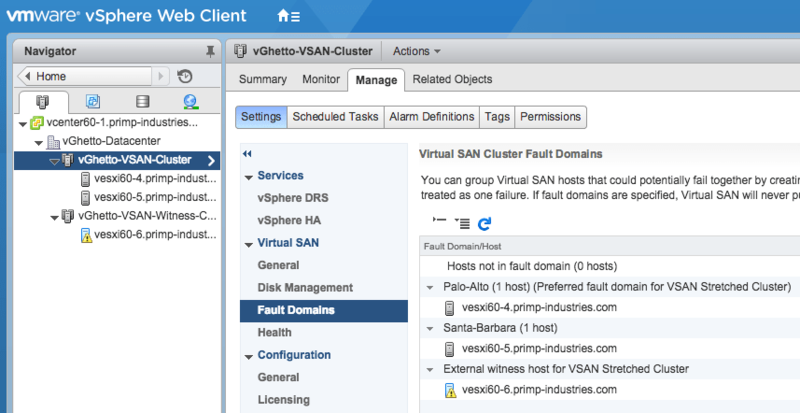 If you are new to vSAN Management APIs, have a look at this blog post on how to get started. As you would expect, the data is exactly the same since they both consume the same underlying vSAN Management API. 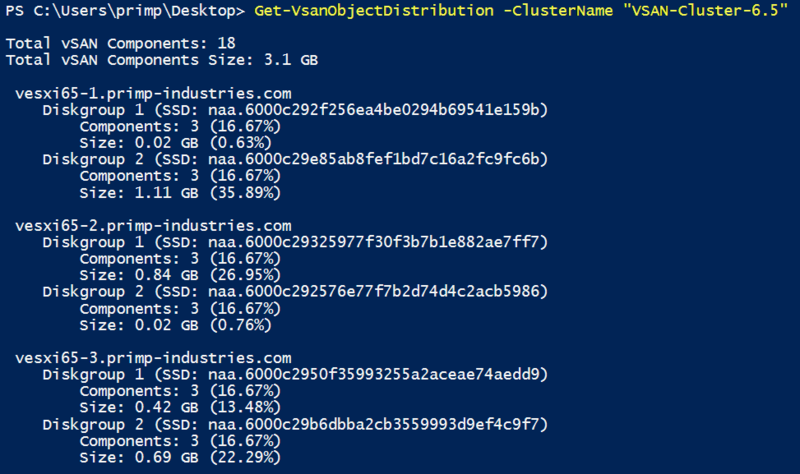 [Read more...] about How to convert vSAN RVC commands into PowerCLI and/or other vSphere SDKs? The Ruby vSphere Console (RVC) is an extremely useful tool for vSphere Administrators and has been bundled as part of vCenter Server (Windows and the vCenter Server Appliance) since vSphere 6.0. One feature that is only available in the VCSA's version of RVC is the VSAN Observer which is used to capture and analyze performance statistics for a VSAN environment for troubleshooting purposes. For customers who are still using the Windows version of vCenter Server and wish to leverage this tool, it is generally recommended that you deploy a standalone VCSA just for the VSAN Observer capability which does not require any additional licensing. Although it only takes 10 minutes or so to setup, having to download and deploy a full blown VCSA to just use the VSAN Observer is definitely not ideal, especially if you are resource constrained in your environment. You also may only need the VSAN Observer for a short amount of time, but it could take you longer to deploy and in a troubleshooting situation, time is of the essence. I recently came across an internal Socialcast thread and one of the suggestion was why not build a tiny Photon OS VM that already contained RVC? 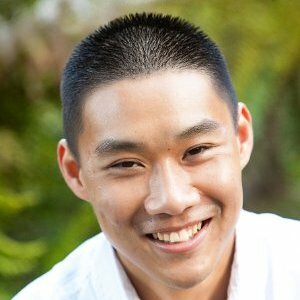 Instead of building a specific Photon OS that was specific to RVC, why not just create a Docker Container for RVC? This also means you could pull down the Docker Container from Photon OS or any other system that has Docker installed. In fact, I had already built a Docker Container for some handy VMware Utilities, it would be simple enough to just have an RVC Docker Container. The one challenge that I had was that the current RVC github repo does not contain the latest vSphere 6.x changes. The fix was simple, I just copied the latest RVC files from a vSphere 6.0 Update 1 deployment of the VCSA (/opt/vmware/rvc and /usr/bin/rvc) and used that to build my RVC Docker Container which is now hosted on Docker Hub here and includes the Dockerfile in case someone was interested in how I built it. 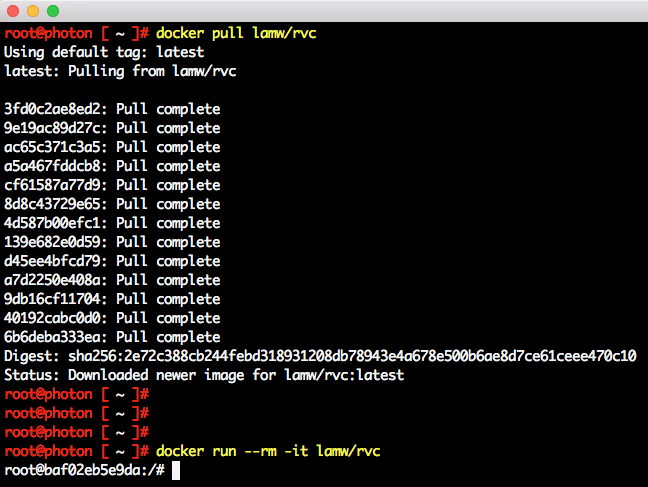 As seen in the screenshot above, once the Docker Container has started, you can then access RVC like you normally would. 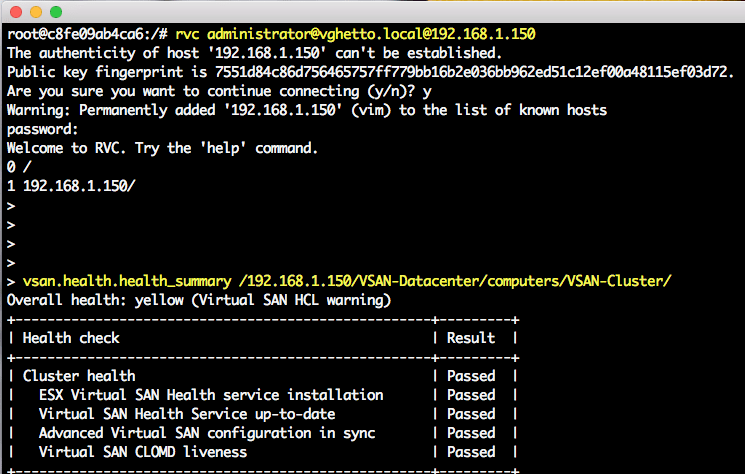 Below is an quick example of logging into one of my VSAN environments and using RVC to run the VSAN Health Check command. Once the RVC Docker Container has started, you can then start the VSAN Observer with --run-webserver option and if you connect to the IP Address of your Linux Container Host using a browser, you should see the VSAN Observer Stats UI. Hopefully this will come in handy for anyone who needs to quickly access RVC.